You know from this post that making lip balm is a part of my seasonal routine. For a minimal invest of time and money, I am able to keep my family — and my Mom, Dad, and dear friends — in lip balm for quite a while. I love my lip balm recipe! In fact, I can’t even bring myself to buy it from the store ever again. But it was missing something…a touch of color. My search for a natural, plant-based, herbal solution for tinted lip balm lead me to Alkanet Root. Alkanet root has many beneficial properties yet it is primarily used as a very effective dying agent, wonderful for use in lip balms. Used in my recipe, it gave the oils a beautiful deep burgandy tint and on my lips it was the perfect bit of color I had been looking for! Purchase alkanet root and alkanet root powder online by clicking this link to Mountain Rose Herbs. If using the root, plan on infusing 1 tablespoon of the root in 1/4 cup of oil for a week or so, in a small glass mason jar. Shaking daily until you are satisfied with the color. Note: This method will eliminate the need to use the root powder in the recipe below. Can be added straight into your recipe, in the amount that is suitable for your needs. -Alkanet Root Powder to your color preference. To this recipe I add approx. 1-2 teaspoons. 1. In a small pot, or double boiler, over super low heat melt the coconut oil, olive oil, cocoa butter, and beeswax. Stir until just melted. 2. Remove from heat and add vitamin E oil, alkanet root powder, and your choice of essential oils. Continue to stir well in order to combine all the oils and distribute the alkanet root powder evenly throughout the mixture. 3. Pour into your containers and then allow it to cool on the counter until hard. -Another opportunity for creativity comes in the form of your choice for essential oils. The most common additions are: peppermint, vanilla, orange, lavender, anise, cinnamon. -The best source for Alkanet Root and Alkanet Root Powder that I have found is Mountain Rose Herbs. -I love the cocoa butter from The Soap Dish and Mountain Rose Herbs. -You can find beeswax here. -And everything else you should be able to purchase at a local grocery store. I’m allergic to cocoa beans. Could you suggest a good substitution for cocoa butter in your recipe? Gently heat both oils in the top of a double-boiler for about 10 minutes. Remove from the heat, add the alkanet root and steep for around 30 minutes, to extract the colour from the root. Strain the root from the oils through a muslin cloth and compost the root. Return the oils to the double-boiler with the beeswax. Once this has melted, remove from heat and add the rose essential oil, drop by drop. Pour into small, sterilised pots or jars. Allow to cool thoroughly before capping. I’ve never heard of Alkanet Root powder! (I usually use an old lipstick I don’t want anymore.) I will get some at MRH. Thanks! You can replace the cocoa butter with shea butter and still receive the same benefits. Hi! Thanks for the great recipe! Regarding the shea butter…I tried that once and my balm was gritty! In order to use shea butter, it needs to be refined. Check out this site for tips on how to do so @ http://www.atlsmellgood.com. 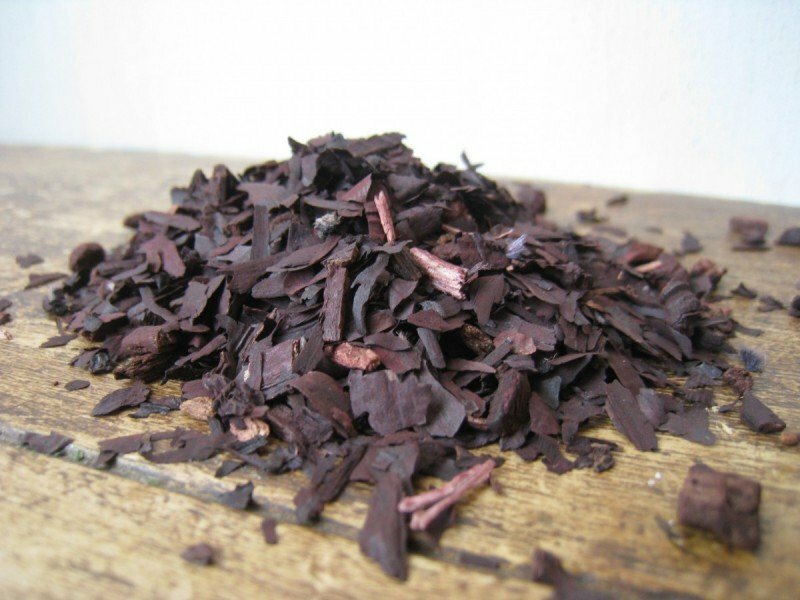 Unrefined is better for skin products because it hasn’t been “stripped down” through the refining process. 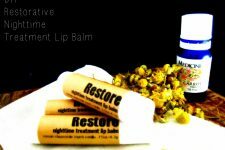 I buy my Shea butter at Mountain Rose Herbs and have had perfectly smooth lip balms. If the butter is fully melted and it’s a high quality butter, it should not be gritty. This is a great recipe that I believe I will try! Just one question: Does this recipe make 1 lip balm or multiple? If multiple, how many!? Hi Chelsea! This makes approx. 3 ounces of balm so it just depends on the size of your containers. Where can I buy the lip balm containers? Is this recipe for one? I love buying my containers online from a few different places. But my favorite place for these one ounce tins is Specialty Bottle. 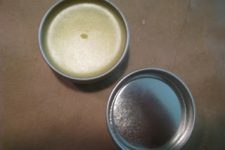 If you order ingredients from http://www.mountainrose.com, you can get tins from them also. this is very cool! 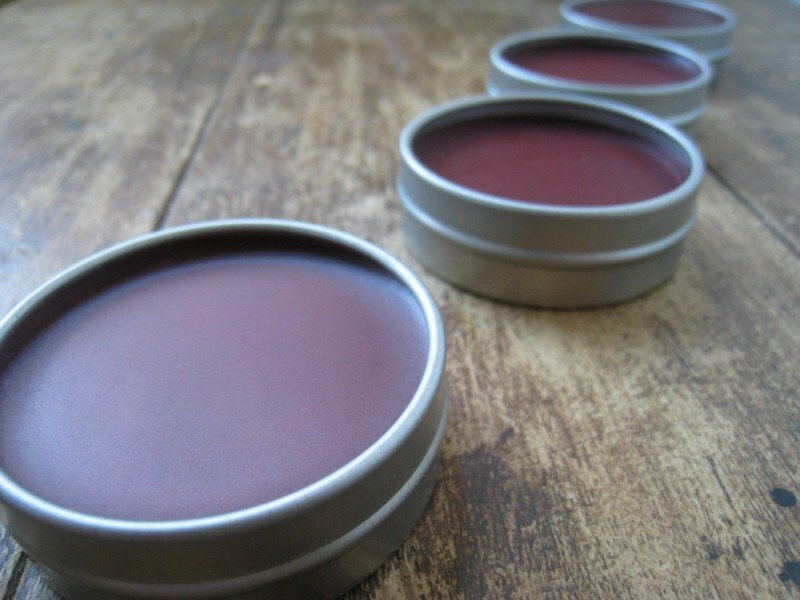 I make lip balm all the time for craft fairs but I have never tried tinting it! Thanks for the inspiration! Great idea, I will have to give it a try. I am always on the look out for natural products. Thank you. Great idea and much better than using petroleum products on your lips. I’m going to have to try this, thanks for sharing. Do you know how this fares in a pocket? I bought a homemade lip balm from a friend of a friend and the balm basically liquefied in my pocket making quite a mess! I’ve been looking for a recipe that will hold up to body heat (or a container that doesn’t leak. LOL). Have never made lip balm before but this looks great! Can’t wait to try it. I have never tried lip balm before. I am going to keep this one in my little cache of natural recipes! Thanks! Lovely recipe! Thank you so much for sharing this one so kindly!!! I am new to this website but love it! It is very kind and thoughtful to share the ideas that you make yourself for your business for others to use free of charge! Bless you! Will definitely try! Do you think it would work with dried Hibiscus flowers? What can you use instead of beeswax for a vegan recipe? Anna, you can use candelilla wax instead of beeswax. Last time I wanted a tinted lip balm I used beet root powder but it didn’t work berry. I’ll have to give alkanet a try. I was just thinking about tinted lip balm the other day! Thank you for sharing this recipe, I can’t wait to try this. I do have a question though. Is this something that can be poured into a chapstick container? I am obsessed with chapstick (Lip Smackers Dr. Pepper, for the tint) but am making changes in my household to using “good-for-you” products instead of poor store-bought options. So, I need something that I don’t have to stick my finger in to apply. I apply chapstick multiple times a day and need something I can throw in my pocket and just pop the cap off and apply when needed. Thank you for any imput! By the way, finding your blog has been the best thing for me! I am so thankful for all the work you have put into it providing such quality products and recipes and for sharing them to us all! I’ve already dumped all my shampoos, anti-bacterial soaps, body washes, and conditioners. I have ingredients on the way to make our lotions and hand salves. Then, onto purging the house of the cleaners and detergents! Look what you’ve started!! Lol! 😉 My husband thanks you. Seriously though, WE really appreciate it. Read my comment below. It should help! Thank you so much! I so want to try this. Thank you for all you do and share. Your blog has been so informative. What a great recipe. I will have to try this and if it’s ok, pass it along to my readers as well. Just found your blog and I’m so inspired. Great stuff! Where do you buy the “pot” (can’t think of a better word in english right now…:)for the balm? Hi Barbara! Yes cocoa butter is very hard. To avoid chipping it away, try weighing it with a small kitchen scale. I can’t wait to try making this lip balm. I was wondering if it does tint your lips and leave a nice rosy stain? I am 60 and would love to be able to use something that leaves a subtle color on my lips that does not fade or wipe off after a short time.. I hate to use lipstick. But with my gray hair I feel like my face just disappears. This might be a silly question but I wonder if I could find a natural, organic food coloring at maybe a Whole Foods Store or somewhere similar and use that instead for the coloring agent. I would think that would make the color stay longer????? Any suggestions?? Where do you order your lip balm containers from? I like that they aren’t plastic and would love to order a few for my lip balm project. After reading the other comments I see that you get the containers from Moutain Rose. What size containers are in the pictures? They have so many to choose from it is hard to know how big they are. I was leaning towards the second to the smallest but will that be a nice size. I have a question about essential oils…specifically lavender. I have just recently began experimenting with essential oils and came to realize the lavender you smell in commercial products is NOT true lavender scent! I don’t particularly like the true scent of lavender and wondered if there was an organic way to get the sweet gentle scent of commercial lavender? Am I missing something? Thanks so much for all your enlightenment on homesteading! I truly enjoy reading your posts! There are many different species of lavender and even the same species can smell quite different depending of what constituents are higher, when it was harvested, etc…keep smelling them! Hi there – I LOVE your site! 😉 I have a quick question for you on this post – how long would you say you typically let your balms “cure”? … I made some about 4 days ago & let them sit overnight to cool. Unfortunately, upon inspection, they were more like goop than balm at that point, so I just set them aside figuring I’d remelt & add more beeswax some other time. But, TODAY, I decided to put some on again, & it was harder than a few days ago. Yay. Still probably could be even harder in my opinion, but definitely way better than 3-4 days ago. Any ideas for colouring agents more commonly found? Just made this recipe and it hardened pretty good. Love the color. I had Alkanet root in oil as per the recipe, but wasn’t sure how much of it to use in the recipe. So I decided to put some of the root in the grinder and made powder. Not sure how this will work out. Haven’t seen any residue on my lips and I love the way it feels.. Any thoughts on this? I will experiment with the oil, just didn’t want to mess up the first attempt. Definitely a keeper recipe. I’m trying the sweet orange oil too. Thanks so much for sharing this recipe!! Can’t wait to try it! I would like to make the alkanet root infusion, but I have a few questions… can you use any oil to infuse? How long do you have to leave it before using the oil? Once it is ready, how much of the infusion do you put in this lip balm recipe? Thanks so much!!! hi :). does it go bad quickly or not? good for…. 6 weeks, 3 months, 2 years, etc…??? thank you for the recipe – awesome site! so if I want other color t instead of alkanet root, what should I search for? How about using Hibiscus flower instead of the Alkanet? Has anyone tried it with alternate tinted items? 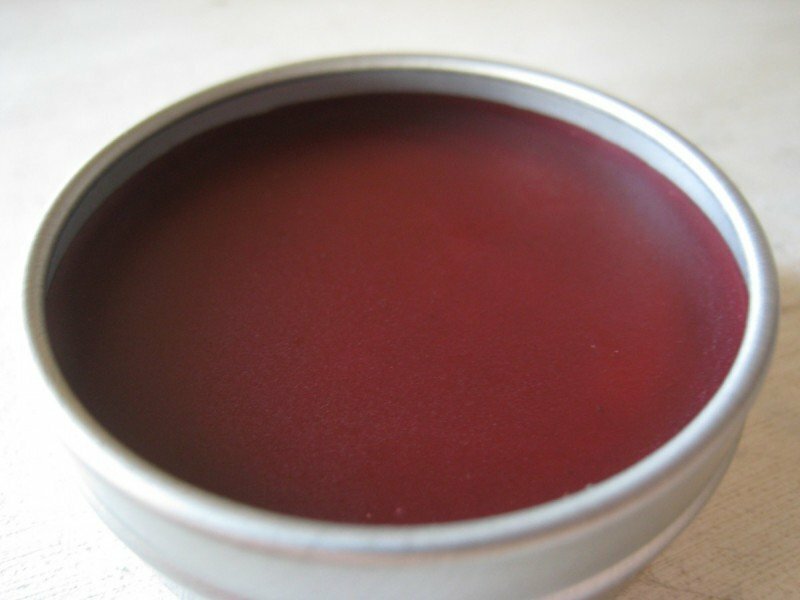 I have used hibiscus powder, it does not mix well yet it does add a nice tint so if you can refine the balm some way that would best. I have also used beet root which works best for me. I have yet to try this suggestion of alkanet root. Any advice for getting the beet root powder to disperse and suspend evenly in lip balm? Thanks! I have recently found out I am allergice to Vit E and it’s oil. Substitute? Since there are no preservatives of any kind in this recipe, how long will it last, and could one add a drop of lemon oil to preserve it? Is there any way to add a natural sunscreen like zinc oxide? HI there! Just a little suggestion, here…Walmart sells cute colorful containers in the travel section that look like they’re good for lip balm! I’m planning on getting some! What can you use instead of coconut oil? Any suggestions? Can mango butter be substituted for cocoa butter? I made a lip balm not only with the alkanet root, but also added rose hip seed oil, sea buckhorn oil, and red palm oil for extra color. I love this lip balm recipe. But one thing alkanet root power doesn’t mix well, it settle down at the bottom of the lip balm after it dry’s. So not happy with alkanet root power. The color is very pretty. What else can I do? Has anyone tried beet juice for coloring? I have a bunch of beets and it looks like a nice red. I was wondering if I could dehydrate minced beet, then infuse oil with it. Does that workable? Jane, tell us how that worked…I just had the same thought! What fruit ingrediants are good for the lips? I have a recipe for lip balm using a correlation of many recipes. The one thing I cant find the answer to is how long will fruit and root tinted lip balms last? since water is a huge culprit for bacteria any moisture left In the fruit or root would keep the balm from lasting long, right? Is vitamin E enough to keep the bacteria from taking over? if so for how long? I know this is an old post, but I was wondering what your thoughts are relative to the toxicity of alkanet root. Using it in lip balm means that some of it will be ingested. I have tried to research this issue and all I keep reading is that alkanet root should never be ingested or used on broken skin. I would hate to unknowingly harm my friends and family by giving them tinted lip balm. On the other hand, the concentration of alkanet root is low in the lip balm, so it might be just fine. Maybe you or one of your readers has some input on this. Thank you. So many people are asking if they can substitute Hybiscus Flower for the Alkanet, and I have not seen a reply. Have you tried it ? And if so did it turn your product purple or red or pink ? I am making a Rose Cream, it calls for alkanet oil, want to sub with Hybiscus, but don want red cream, pink or purply pink is alright. Hmmm, I wonder if I could use pomegranate or berries, dehydrated and ground? Vitamin E oil is not a preservative. It prevents oxidation (rancidity) of oils, but not growth of bacteria. I haven’t found/tested a cure-all natural preservative, but some things to test would be strong spices or spice oils, oregano oil, or grapefruit seed extract (although the net seems to believe that the preservative properties of grapefruit seed extract is primarily due to preservatives in the extract). 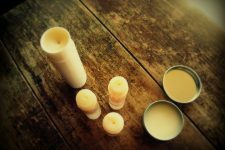 If you use a totally dried plant material to color lip balm, it will not dissolve in the oil and will not contain moisture, so the material will still be “dry” and shouldn’t rot. However, since the material is not dissolved, you run the risk of it settling out and/or being grainy on the lips. There is no cure-all preventative for this, but running the powder through a fine-grain coffee mill will help it suspend evenly and using a higher beeswax concentration and pouring cooler will help maintain the suspension. My attempts to create a colored oil infusion with beet root have not been satisfactory. I haven’t tried hibiscus yet. Based on my reading, I am not comfortable using alkanet in lip products. i tried this but the root powder always separates when it cools/ any suggestions?! I just beginning this and was wondering if anyone has ideas of how to get a coral color. It is about the only color that looks 1/2 decent. Also, any ideas of making sage colored eye shadow??? Love reading all this. Your recipe for lip balm looks great, If I were to add a high performance oil like rosehip for part of the oil, should I heat it with the rest, or add it at the end. Not sure if rosehip should be heated? I just made this, and the consistency came out great. Hardened into a nice balm that melts slightly with the heat of your finger. The only problem is, once I put it on my lips, the alkanet root powder is very grainy and settles to the edges of my lips and looks weird :/ did anyone have this problem, or have a solution for it? I love the idea of diy natural lip balms and this is my first attempt, want to keep fine tuning until I find one that I love!